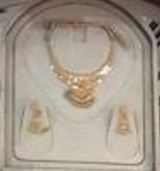 Beautiful Metal Necklace With Earring . Having Golden base. Design with colored stone.